In order to simulate the Stirling engine more easily, the stiffness and damping ratio of the crankshaft bearing are assumed to be steady-state in the research before, but this assumption is contrary to the real condition. Therefore, in this paper, a time-varying stiffness and damping ratio of the crankshaft bearing simulation method has been proposed. Compared with the simulation results of the crankshaft bearings with constant stiffness, the speed fluctuation coefficient of output shaft and crankshaft in time-varying stiffness model is increased by 10%, 24.6% and 13.7%; the vibration displacement of the center mass of output shaft is decreased by 3.0%; the average dynamic load on airframe is increased by 47.9%. 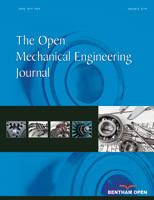 From the simulation results, it is found that the time-varying stiffness and damping ratio of the crankshaft bearing is significant to the characteristics of the Stirling engine dynamic response.